Barcelona 2018/19 Home Shirt | Celebrating 20 years of history! 1998 was a great year for Barcelona because they won their 15th La Liga trophy. Furthermore, it was also this year that Barcelona started a long history with Nike, working together to make the first Nike Barcelona Home Shirt. Now 20 years has gone, and Nike is ready to celebrate the milestone with a new 2018/19 Home Shirt! The 2017/18 season has almost been marked as a walkover season for Barcelona. Winning almost every game in La Liga while taking the Copa del Rey trophy. To celebrate the season that has passed and the trophies that they won, Nike has went deep in to the archives to get some inspiration. Could there be a better way to both celebrate 20 years of history and their 25th La Liga trophy and 30th Copa del Rey trophy, than a new Home Shirt? The new Barcelona Home Shirt is a classic Barca shirt with thin blue and red stripes running down. The sleeves are made plain blue and with the well-known Aeroswift pattern on the sleeves. The local Catalan roots are also represented on the shirt, which can be spotted in the collar where the Catalan flag is represented. 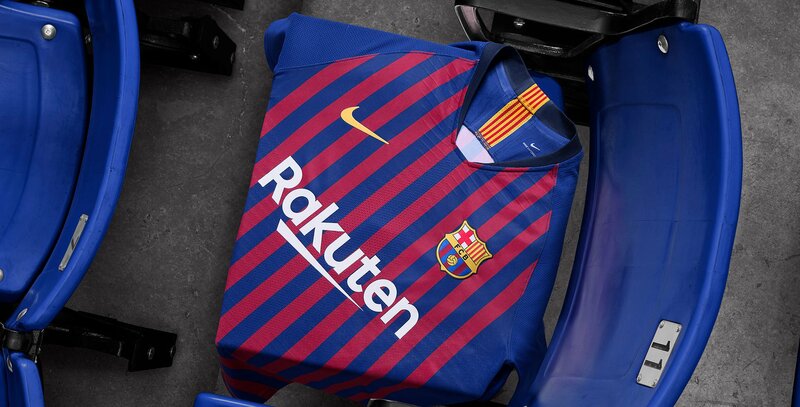 The traditional Home Shirt will be accompanied with darker blue shorts and socks, this is made to link up to the first shirt Nike made with Barca back in 1998. At first this might look a bit odd, but after some time you get used to it. And it looks really great, there might be some Barca fans out there thinking back to the good old days with a young Xavi, Rivaldo, Figo and all the other good old legends! Excited about the new Barcelona 2018/19 shirt? Then you can get it from the 21th of May.